Amarnath Temple is a highly revered Cave Temple dedicated to Lord Shiva situated around 141 km from Srinagar in Jammu and Kashmir, India. Situated at an altitude of 3,888 m above the sea level, the Amarnath Caves stand at the end of Lidder Valley. The main Amarnath Cave Temple is the abode of Lord Shiva who is formed naturally of an ice – stalagmite. This Lingam is believed to grow and disappear with the phases of the moon. As such, the lingam excels on the full moon day and slowly diminishes and disappears on the new moon day. According to Hindu mythology, Amarnath is the cave used by Lord Shiva to explain the secret of life and eternity to his divine consort Goddess Parvati Devi. On the left side of the Shivling is an ice formation of Lord Ganesha and on the right are ice formations of Parvati and Bhairava. Amarnath Yatra is an important pilgrimage for Hindus. According to Hindu belief, the Amarnath Cave Temple Yatra begins on Ashadha Purnima (Full Moon day in the month of Ashadha) and ends on Shravana Purnima (Full Moon day in the Hindu month of Shravana). That is, the annual yatra is performed during July and August. 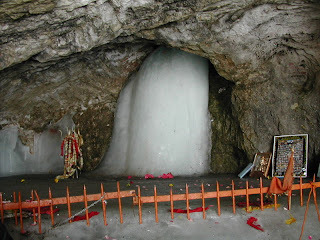 In 2012, the Amarnath Yatra 2012 begins on 25th June 2012 and concludes on 2nd August 2012 on Raksha Bandhan festival day. The pilgrimage generally starts from the 42 km travel on foot from the town of Pahalgam, (about 96 km from Srinagar) and lasts for four to five days. The traditional trek route is Pahalgam – Chandanwari – Pissu Top – Sheshnag – Panchtarni – Amarnath Cave. 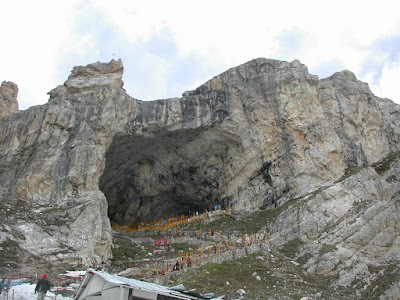 The Amarnath Cave is reached on the full moon day and the pilgrimage is complete. Another route is the shorter route from the town of Baltal. About 400,000 people visit the Amarnath Cave Temple, during the 45 days Amarnath Yatra pilgrimage season. Amarnath Cave Temple is believed to be of 5,000 years old. Legend says that a Muslim shepherd named Buta Malik discovered this Holy Cave. He was given a bag full of coal by a saint. The shepherd went home and opened the bag. He found that the bag was full of gold coins which made him happy. He went back to thank the Saint. But he found that the Saint had disappeared and noticed The Holy Cave. Thereafter this has become the holy place of pilgrimage. Another legend about Amarnath Cave Temple says that the valley of Kashmir was beneath water and it was the Sage Kashyap who drained the water through rivers and rivulets. Bhrigu Rishi who was on his way to The Himalyas was the first person to have found this Holy Cave and the Lingam. According to Hindu Myth, Lord Shiva was looking for a secret isolated place to tell the "Amar Katha" to Goddess Parvathi and thus he selected the Amarnath Cave. He left his vehicle Nandi, the celestial bull, in Pahalgam, released the moon from his hair at Chandanwari and on the banks of Lake Sheshnag, he released the snakes. He left his son, Lord Ganesh, at Mahagunas Parvat and at Panjitarni, he left Five Elements of life - earth, water, air, fire and sky. At last he created Rudra named Kalagni and ordered him to fire up and remove every living thing in and around the holy cave. Then the Lord took Goddess Parvathi inside the cave to narrate the Amar Katha. The nearest airport is at Srinagar, around 141 km away from Amarnath Temple. Jammu (300 km) serves as the nearest railhead and bus station. Jammu and Srinagar are connected through road services.